I’m highlighting teaching artists, staff members, artists and students who work with us at Hubbard Hall at least weekly. There are so many great people who make up Hubbard Hall and I hope you’ll enjoy meeting them each week. 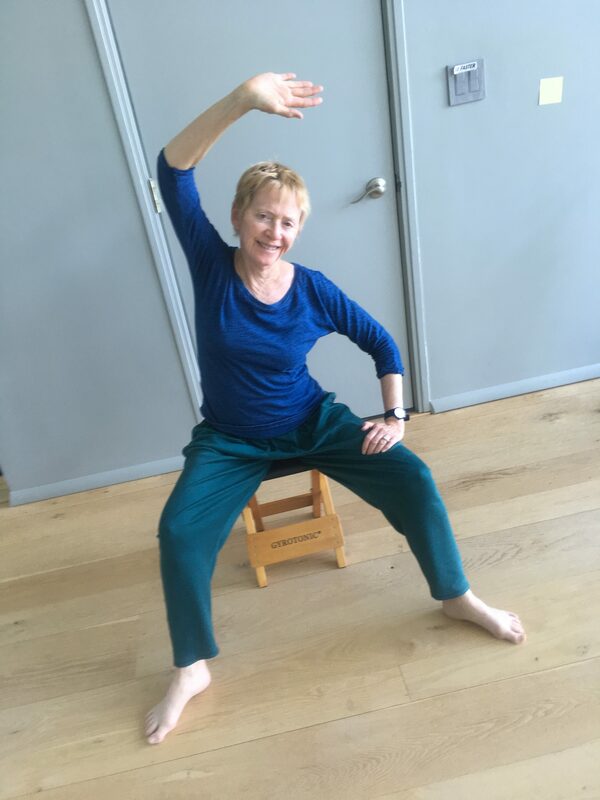 Jacquie Farbman is a treasured member of our faculty, who helps students find new ways to be flexible and free in their bodies. She’s a smart, engaging presence, someone who’s always helping us think outside the box and bringing a bright energy to the Hubbard Hall campus. I urge you to take a class with her, if you haven’t already. She’s a trip. I’m Jacquie Farbman, always interested in finding and sharing ways to feel good, free, and healthy. This led me to a teaching and performing career in modern dance—and more recently to Gyrokinesis. After years of teaching dance at colleges and at a performing arts high school, through “Gyro” I now explore with students ways to move with flow, ease, and healthful posture—to promote a long, strong, enjoyable life. I teach Gyrokinesis, a blend of yoga, qi gong, dance. and core strengthening movement. It is a mainly seated workout promoting flow, breath and abdominal strength. Includes standing balance exercises. Getting new people to know about the class, and what in the world “Gyrokinesis” is! Students tell me that a main benefit from the class is new awareness, in everyday life, of how to sit and stand, and move with better posture. And they move with more ease and core strength. 1—the people. I love my students. Many I’ve known over seven years since I started teaching at HH. All, including newer students, are such interesting individuals, open and receptive to new ideas. And staff, teachers, audience members, everyone I’ve met at HH are people worth knowing! 2—HH is a place where “risks” can be taken. Case in point was trying a newer, class, Gyro, when we started. Many cutting edge theatre and other innovative arts events are planned and staged here. Hubbard Hall is a hub of activity that draws interesting, motivated people together to see and/or participate in arts events and classes. It is a great place for “self-improvement” both physical and mental. Plus it’s a way to meet good folks!